I believe that in chess, everything depends on tactics. Amongst masters, combinative and positional play complement each other. With combinations, they attempt to refute false values, and by positional play to demonstrate true values. What are Tactics and Combinations? We begin by identifying the essence of the matter under consideration. It will soon become apparent that, although the term 'tactics' appears on nearly every page of nearly every chess book, it is far from simple to find its exact and accepted meaning, just as it is similarly difficult to do so with other very important elements connected with tactics. For example, this is how the elusive term is defined in the substantial tome The Chess Dictionary, published in Moscow in 1990: 'Tactics is the sum total of the devices and methods of carrying out the specific chess operations, which enter into the strategic plan and its fulfilment." What can one say about this definition? Do you understand what it is saying? I for one do not, and it is all the more difficult to agree with it, because it is quite unclear on what grounds one should distinguish tactical devices and methods from non-tactical ones. Or should one consider all such means to be tactical? But does that then mean that everything in chess is tactics? Evidently, a clearer definition is needed. I believe that the following is best: tactics deal with current problems, that is, problems which need to be solved here and now. Another very important factor, it seems to me, is that in chess the distinction between tactical and other methods of solving a particular problem results to a significant extent from the player's emotional perception. What I mean is that chess-players traditionally consider an operation to belong to the realm of tactics when it is at first glance unexpected, non-standard, often sharply changing the development of the action on the board, or its intensity. For ordinary life, such events are frequently described as revolutionary. Tactics in chess consist of two basic elements: tactical blows (sometimes called combinative blows) and combinations. For several centuries, these two highly important and well-known elements have not been adequately distinguished and formulated, although many attempts have been made. It may seem that there is no great necessity for this, since any player, of even minimal experience, can recognize a tactical blow or combination when he sees one, but nonetheless, it is always useful to have a precise and clear formulation of basic principles, of whatever sort. The advantage is that a successful formulation, which accurately describes the characteristics of a phenomenon, helps in detecting the presence of that phenomenon in a complicated situation, and in this way, even a relatively weak or inexperienced player can find himself able to do things that previously had seemed impossible, for any but a master. However, I should like to add that although tactical blows and combinations are two separate things, if you try to work out (even in your imagination, let alone putting it into words) what exactly is the difference, you will soon run into problems. 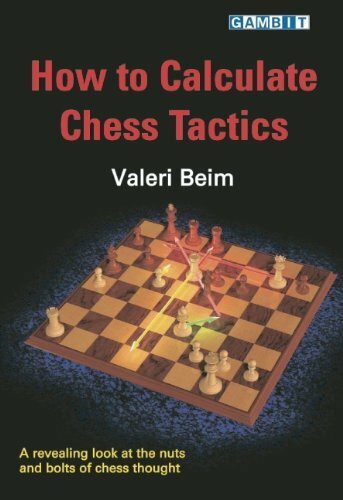 Title: "How to Calculate Chess Tactics"